Switcheroo and Hop-Over are versions of the classic Leaping Frogs puzzle, or Frogs and Toads puzzle. 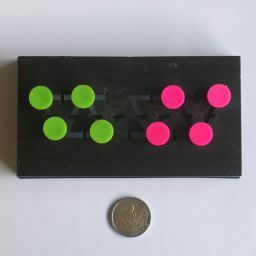 There is a row of 9 holes, and at the start four holes on the left are filled with marbles of one colour, and the four holes on the right with marbles of another colour, which leaves only the centre hole empty. The aim is to swap the two colours using only forward moves (moving a marble forwards by one hole) and jumps (jumping one marble over another so that it goes forwards a distance of two holes). Versions of this puzzle exist with a different number of pieces, and it can be solved using any number of each colour. In the classic puzzle literature there are usually 3 of each in the shape of frogs. It was described in "Puzzles Old and New" by Professor Hoffmann in 1893, where it goes by the name "Right and Left Puzzle". Other names are "Jumping Frog Puzzle" and "Jeu des Grenouilles". 'Switch' is a puzzle by Mag-Nif. It has a board with tracks that connect nine peg locations. There are 8 pegs (four red, four green) that can slide along the tracks. The nine locations are arranged as a row of five, with a row of four underneath it. Each row is connected by a horizontal track, and each location on the bottom row is connected by diagonal tracks to the two nearest locations on the top row. The game starts with the colours separated and the space in the middle. The aim is to swap the colours in as few moves as possible. It may not be immediately obvious how similar it is to the leaping frogs puzzle. Consider the diagonal sections of the track together as forming one long path. The pieces can slide forwards or backwards along that path. Moving a piece along a horizontal section is equivalent to going forwards or backwards two places in the path. This makes the puzzle equivalent to the frog jumping puzzle but without the restrictions of only moving/jumping forwards. Cut The Knot has a similar analysis of this puzzle. Let a normal move to the left or right be denoted by L and R respectively. Left or right jumps will be denoted by LL and RR. The structure of the solution above is quite obvious, made especially visible on the board of Mag-Nif's Switch. It can easily be extended to a solution for a larger number of pieces. Let's consider the general case where there are m marbles of one colour and n of the other colour, on a board with m+n+1 holes. I'll write this case as (m,n). If two marbles of the same colour are adjacent and neither of the two conditions holds, then the puzzle has reached an unsolvable state. If two marbles of the same colour are adjacent then the only way for a marble of the other colour can pass them is if the two marbles become separated. This can only happen if the front marble moves or jumps forward into an empty space. So if there is a marble of the other colour still ahead of them, then the space must also be ahead of them for it to still be solvable. The same argument can be made with time reversed. If two marbles of the same colour are adjacent then the only way for a marble of the other colour to have passed them is if the two marbles were separate at some earlier point in time. They could only have become adjacent if the rear marble moved or jumped forward into an empty space. So if there is a marble of the other colour already behind them, then the space must also be behind them. Putting these two together, the space must lie on the same side of the pair of adjacent marbles as any of the marbles of the other colour. Since the space can only be in one place, all the marbles of the other colour must be on one side of the pair, together with the space. A marble will never jump a marble of the same colour. Such a move shifts the space from one side of the pair to the other, and at least one of those two positions violates the adjacency lemma. The above information is enough to give you the complete solution if you can look two moves ahead. At any point during the solution there are at most two options (provided we already exclude jumping over a marble of the same colour). In the starting position both options are equally valid, and in most other cases one of the options immediately leads to a position that violates the conditions of the adjacency lemma. In the remaining cases with two options, the wrong move leads to a position where the only options left will violate the lemma. These rules for the cases with two available moves can be captured in a few simple patterns as shown below. The order of the marbles of one colour remains the same. As marbles of the same colour don't jump each other, they cannot change their order. In the solution to the (m,n) puzzle, there will be mn jumps and m+n normal moves. Every marble of one colour must pass each and every marble of the other colour. Each of these exchanges involves one jump (of either marble). There are therefore mn jumps, one for each pair of differently coloured marbles. Marbles of the same colour do not change their order, so for each marble we know its exact final location. The m marbles of one colour each must move forward exactly n+1 spaces, and the other n marbles move forward m+1 spaces. This means that a total distance of m(n+1)+n(m+1) must be travelled. The mn jumps account for a distance of 2mn, leaving a distance of m(n+1)+n(m+1)-2mn = m+n to be travelled using normal moves. Therefore m+n moves are necessary. In an (n,n) puzzle with n even, then every marble moves once and jumps n/2 times. Every marble must travel an odd distance, so will have to perform at least one normal move. This already accounts for the 2n available moves in the solution, so every marble moves exactly once. They all travel the same distance, so the n2 jumps are evenly distributed over the 2n marbles as well, and they jump n/2 times each. If the restriction on only moving pieces forwards is removed, then the standard solution is the shortest. For example, the shortest solution to the Switch puzzle is the same as the solution for the normal (4,4) puzzle. If backward moves are allowed, the adjacency lemma is no longer valid, and so it is no longer necessarily the case that jumping a piece over one of the same colour is prohibited. Such a forwards jump would be equivalent to two forward moves, so might allow a shortening of the solution. However, as seen in the proof, such a forward jump can only be performed in a position that the adjacency lemma prohibits, or if not, leads to such a position. Such a position cannot be solved using only forward moves, so at least one backwards move must also be done to still solve it. Any gain from performing the jump is therefore lost by the inclusion of a backwards move. Even if you arrange to have more than one forward jump with the same colours, you'll find that you need at least as many pairs of adjacent pieces that violate the adjacency lemma, and so at least that many extra backward moves are necessary, wiping out any advantage of the jumps. Now let's examine the (n,n) solution more carefully, and see how it can be built up from smaller parts. Suppose you start with an (n, n) puzzle in the starting arrangement. There is a sequence of moves and jumps that rearranges the marbles to a position where the blank space is at the right end, the marble at the left end has not moved yet, and the row of marbles alternates in colour. Let's call this sequence of moves Tn. It is illustrated in the picture below, together with its mirror image which I will call Tn'. So now we have a position where the marbles are arranged so that the marble at one end hasn't moved, the marbles alternate in colour, with the empty spot on the other end. 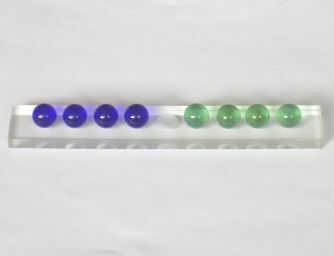 The n marbles of one colour (including the one that hasn't moved) can all jump forwards one by one so that you reach a similar position, but mirrored. The empty space is on the other end now, and the marbles still alternate in colour. Let's call this sequence of n jumps Sn. This, and its mirror image Sn' is shown in the next picture. A solution for the (n,n) puzzle consists of Tn, followed by Sn, followed by the inverse of Tn'. While the sequence Sn is completely known, Tn is not, so we need to break that up into smaller steps. On an (n,n) puzzle we can apply Tn-1 and Sn-1 to the board excluding the outermost marble at each end. The single move of the loose outer marble, then brings the marbles into a fully alternating position, the end result of what Tn' would have done. Therefore for n>1, Tn is broken down into Tn-1', Sn-1', and a single move. T1 is just a single move. With this breakdown, we can verify that this solution satisfies the move count theorem. Sn obviously consists of n jumps and no normal moves. Tn consists of one more move and n-1 more jumps than Tn-1. Since T1 has only one normal move, it is easily seen that Tn consists of n normal moves and 0+1+2+3+...+(n-1) = n(n-1)/2 jumps. The complete solution consists of one Sn and two Tn, so has 2n normal moves and n + 2*n(n-1)/2 = n2 jumps, as expected. If the number of marbles of each colour are different, then we can do a very similar breakdown. Let's assume that the colour with the fewest marbles (m marbles) starts on the left. We can apply Tm to it, simply by ignoring the rightmost n-m marbles. This time it does make a difference if it is done in mirror image or not, but both lead to a solution. So we now have two possible arrangements of 2m alternating marbles and the space, with n-m marbles of the more abundant colour on the right. Applying Sm or Sm' followed by a single move shifts the arrangement one space to the right, past one of the abundant marbles. By doing this n-m times, the alternating arrangement reaches the right hand side. At this point we just have to finish this in the same way as the normal (m,m) case, by doing Sm followed by the inverse of Tm' (or Sm' followed by the inverse of Tm). Again we can verify that this solution satisfies the move count theorem. It consists of two applications of Tm, n-m+1 applications of Sm, and n-m normal moves. That gives 2m+n-m = m+n normal moves and 2m(m-1)/2 + (n-m+1)m = mn jumps, as expected. It is interesting to note that the sequence of moves and jumps is palindromic if we ignore their directions. The beginning Tm matches the final Tm-1 (or Tm' -1), and in between those we have a sequence of applications of Sm/Sm' interspersed with single moves which is also palindromic.